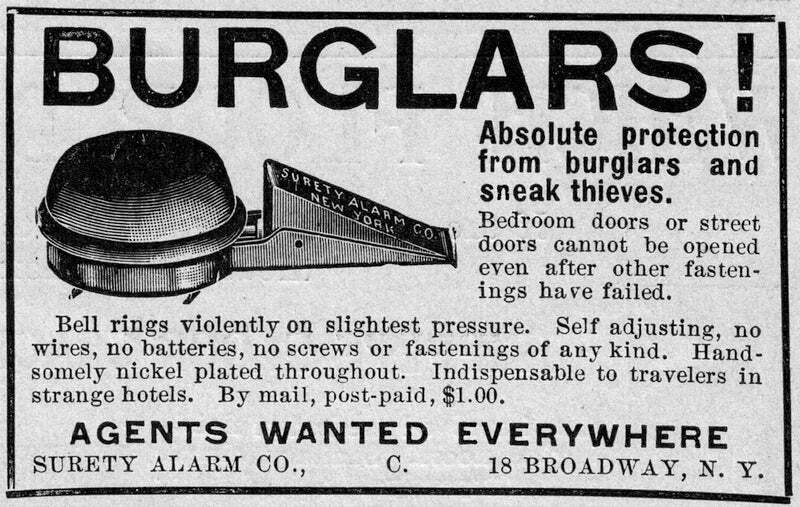 I was flipping through my deadtree archive of magazines recently when I came across an ad for an ingenious little door alarm in 1906. Granted, it’s not fancy. But it probably did the trick. As you can see from the full ad below, which appeared in the February 17, 1906 issue of the Literary Digest, the people who designed the ad certainly knew how to grab your attention. The ad explained that the portable little alarm didn’t need batteries or wires of any kind. Just stick it under the door, and the bell will ring if someone tries to open it. The cost? Just $1. Or about $25 (around £17) if you adjust for inflation. What happened if the burglar still insisted on coming in even if they knew they were found out? Well, the next part was up to you. An old fashioned gun was probably in order. Because the shockwatch wouldn’t be invented for another 20 years.